In the middle of the dunes, miles and miles from anywhere you feel like you are in the middle of nowhere. 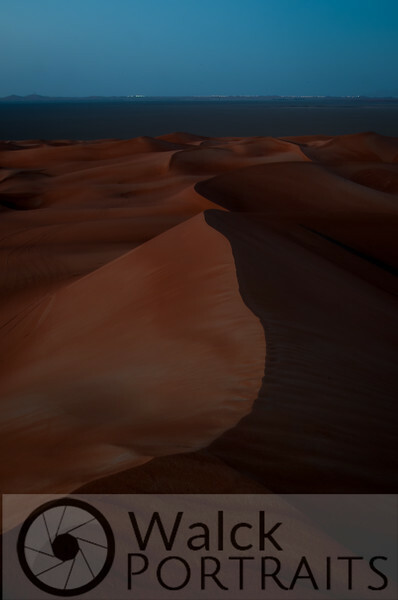 When you climb a tall dune at night though, that all changes as you can see the lights of civilization miles away. I made this image in Oman, close to Jebal Hafeet. The dunes here are deemed the "Starfish Dunes", as Jebal Hafeet affects the wind patterns, and creates unpredictable dune patterns. Light is so amazing. I am always intrigued by how light reflects, shapes, and highlights a scene. Looking from the top of a tall dune, I could see across the sabkha (salt flat), where another tall dune was. I wanted to grab my telephoto to check it out, and when I did I saw the most amazing lines in the dunes that were close to me. So - I went on a hike with this idea in mind of finding dune slopes that intersected closely, whilst placing the dune in the distance into the middle of the frame and intersections. 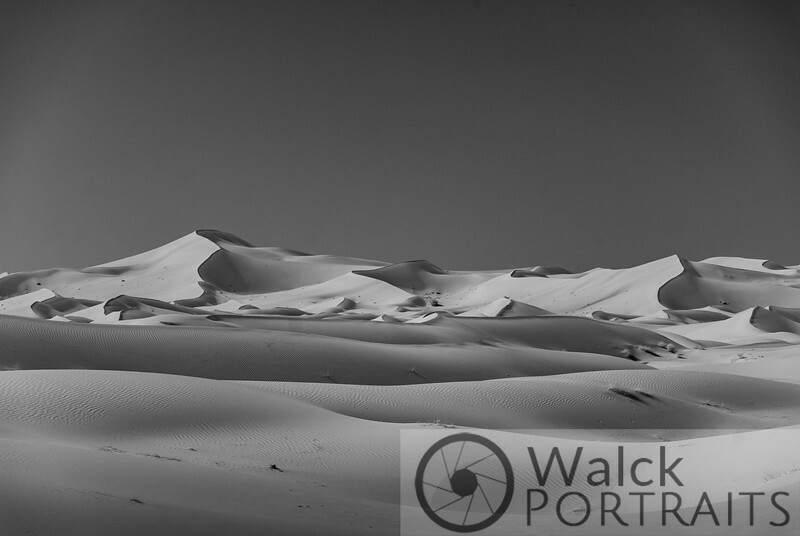 From the start of my thought process I knew I wanted a black and white image to show off the lines and shading in the dunes. The biggest trick was finding a place where the sun was at just the right angle - slightly to the camera's left and nearly backlighting the entire scene. The best part of this image was the hike to get it. 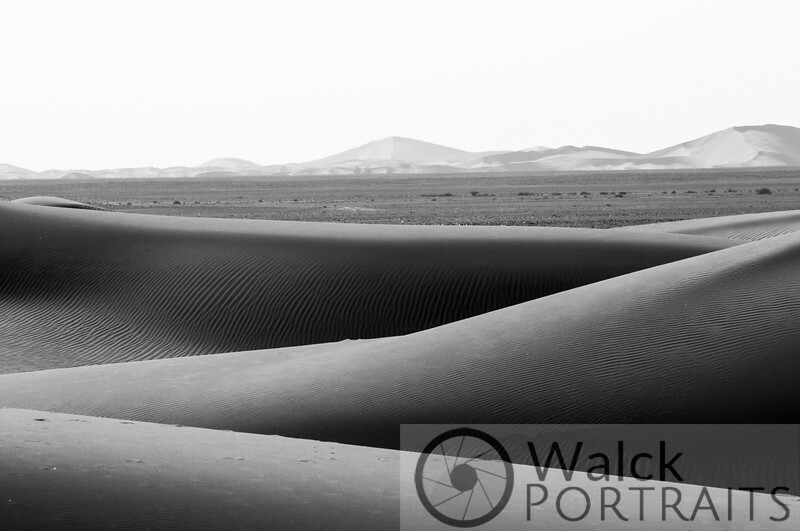 I crawled up 4 dunes scoping out the landscape before I chose this as my favorite scene to shoot. As soon as we pulled into camp I saw the massive dune towering above us. "Hey Tim, you want some dinner?" - "No - there is a dune screaming to be scaled!". Looks are deceiving. Do you see the bushes on the dune to the left? The little tiny specs... - They are the size of a full sized SUV. 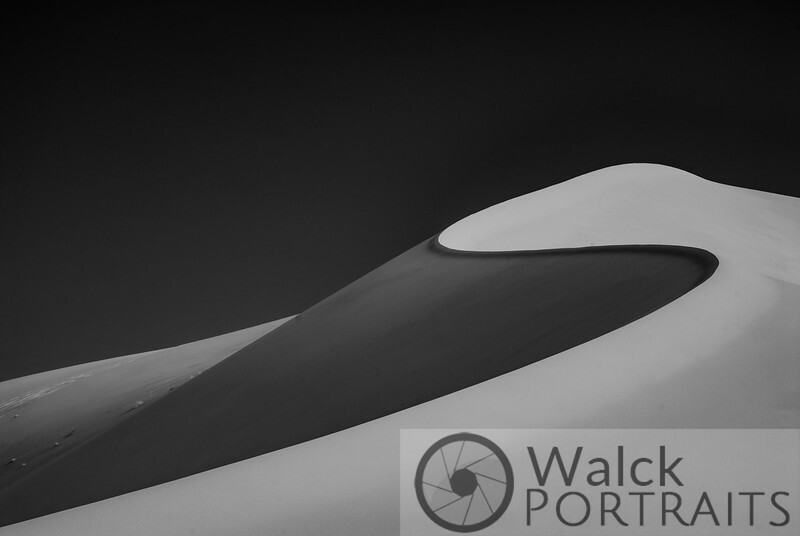 I shot this dune at 200mm, from quite far away. The tell tell sign to me of its massive size is that you can't really make out the ripples from the wind. The entire dune has become somewhat smooth looking in this image because I was so darn far away when I made the capture. I later climbed this dune - you can flip through the gallery and see some images from its top. 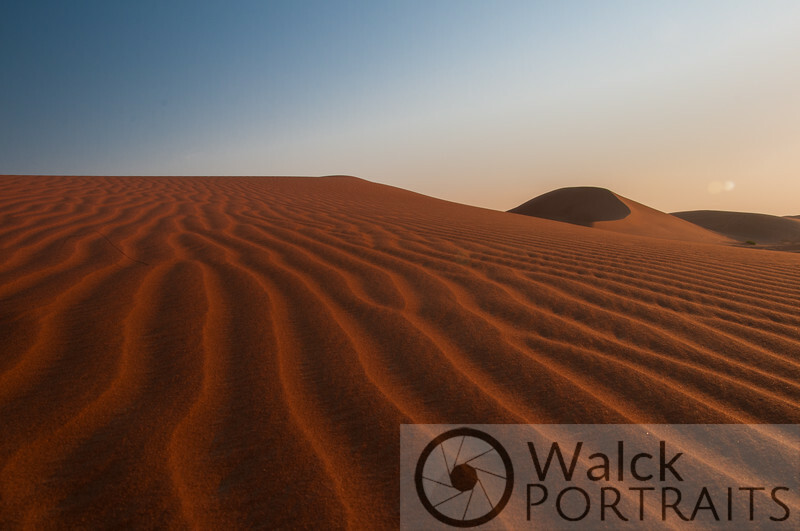 This particular set of dunes in Oman is deemed the "Starfish Dunes" because of their irregular and unpredictable shapes. 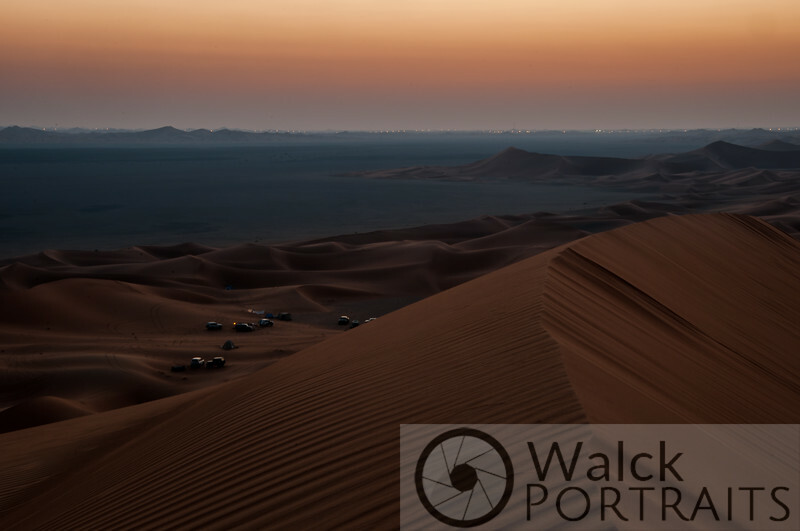 Normal sand dunes in the UAE and Oman area tend to look similar, having peaks and valleys of similar height and angles, but these dunes are different because Jebal Hafeet blocks the wind and causes it to swirl about. Look closely at this image. I was careful to shoot it because it showcases the wind patterns in this area. 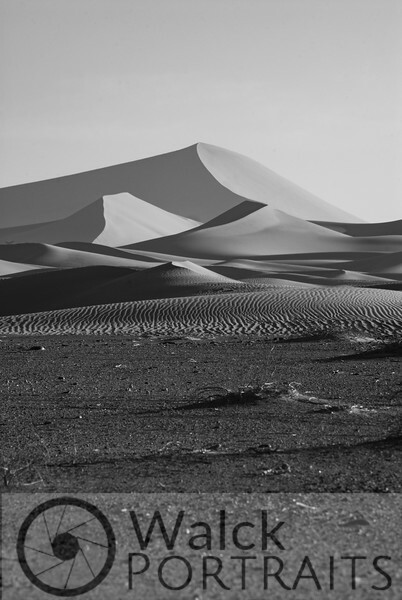 Notice that the dunes in the distance are sloped left to right. Now look at the dunes in the foreground and notice how the slope up and down away and towards the camera. 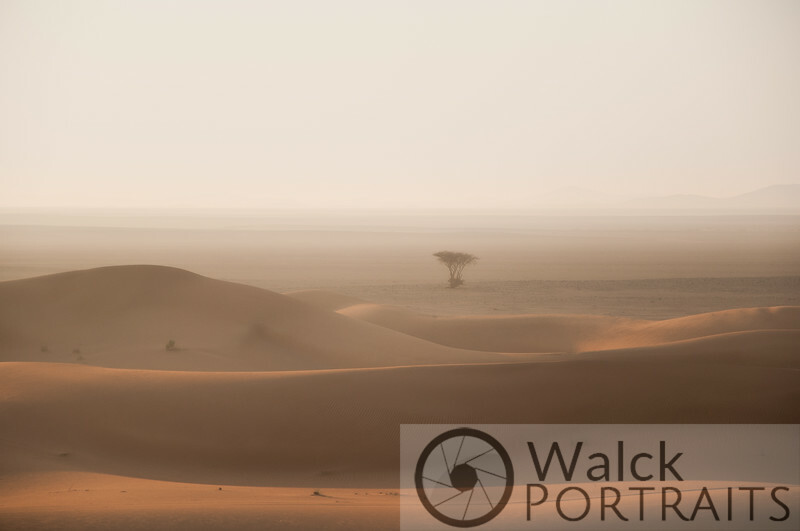 Use your imagination and you can picture the wind traveling from the bottom right of the frame up and to the left towards the middle of the image, then curving around to the right in the background to shape the dunes. I named this "Twin Starfish Dunes" because of the two large dunes in the background that have a similar arch in their crest line - as this is rare to see in this part of the desert. 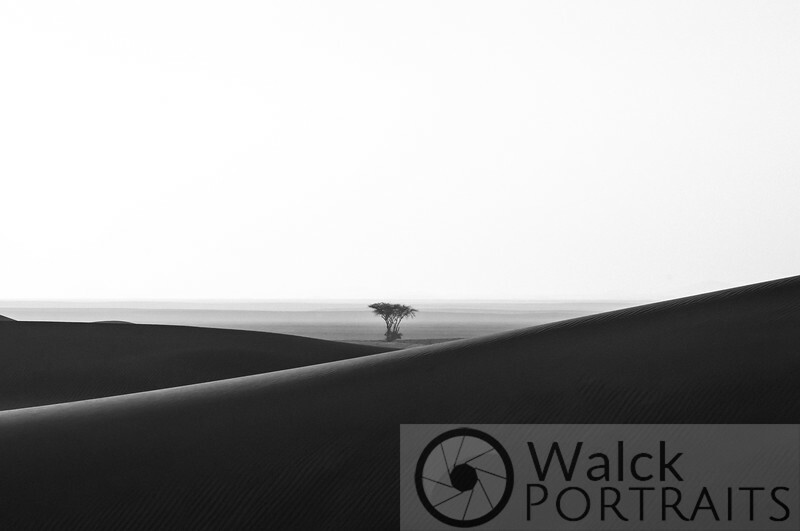 There was a lone tree out on the sabkha, not far from camp. I knew it would make a nice image early in the morning when the sun is making a nice golden light at a low angle. I enjoyed shooting this tree so much that I went on quite a hike to find as many angles as I could to create variations on the same subject.